The Honest Company, co-founded by Jessica Alba, is a healthy lifestyle brand which creates products that are safe, effective, eco-friendly, convenient and affordable. The Honest Company baby essentials are safe, effective and honestly adorable. They are simply pure – NO risky fragrances, lotions, or latex. 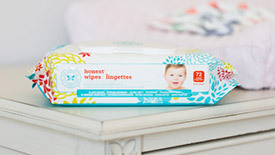 The Honest Wipes are perfect for sensitive, wet bottoms and messy fingers; to sticky countertops and gunked-up toys. This wipe is ultra-versatile and can do it all!